The service is said to be based on subscription-based digital magazine app Texture, which is expected to be integrated into the Apple News app on iPhone and iPad, pending approval of Apple's agreement to acquire the company. 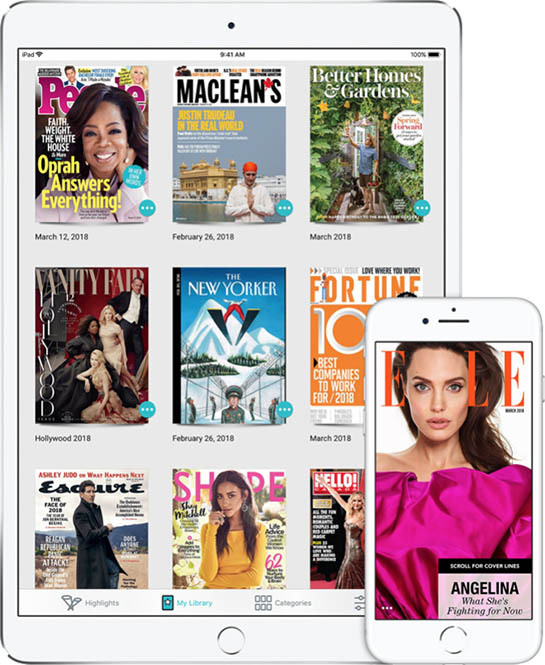 Texture provides unlimited access to over 200 digital magazines for $9.99 per month. Available magazine titles include People, Vogue, Rolling Stone, National Geographic, GQ, Sports Illustrated, Wired, Maxim, Men's Health, GQ, Bloomberg Businessweek, ESPN The Magazine, and Entertainment Weekly. "We are committed to quality journalism from trusted sources and allowing magazines to keep producing beautifully designed and engaging stories for users," said Apple's services chief Eddy Cue, on Apple acquiring Texture. The service would essentially be like Apple Music, which provides unlimited streaming of over 45 million songs for $9.99 per month, but for news and magazines. The revenue would help boost Apple's growing services division, including the App Store and iCloud, while a cut would also go to publishers. Perhaps it's just me, and perhaps I'm out of touch, and perhaps I'm totally wrong. but does this not have "Fail" written all over it ? So yes, a magazine service fits nicely with the "Apple in 2018" equation. Please. Expand. News. To. Other. Countries. Seriously, didn't News.app launch with iOS 9? They're able to push so quickly with some things (hardware, carriers, Music) to hundreds of countries but News seems stuck in just a few locales. Heck, even Pay is available in more places. Man, this subscription model is just getting out of hand. I try to minimize as much as I can having media subscriptions. It’s just ridiculous on top of all the bills an individual can normally have. Here it’s a hint Apple. Come up with a single service subscription that encompasses iCloud storage, music, movies, news, etc. Simplify and give a Big Bang for your buck and I think many people would jump in. Breaking it all apart and having too many subscriptions = failure IMO. I used to read magazines a lot when I was a child... Ranger Rick, National Geographic, countless others I've forgotten... I'd beg neighbors for newspapers and even got a print WSJ subscription for free from a kind soul. Loved to read as a kid. Now days? I can't stand spending $ on the <bleep> that most magazines print. The advertisements for even paying customers is beyond insane. Over the last 20 years I've got to see the quality degrade and the advertisements and paid "try this new product!" crap increase. I can't stand newspapers either. Maybe I'm getting old and grouchy in my 30s but... I find a lot more fun in buying a book and reading it. No subscriptions, no advertisements, ahhhhhh. I try to read 5-8 books a year and wish I could read more. Every now and then I'll pick up a magazine, cringe at the $3.99 cost, and then remember why I don't spend $ on this crap anymore. Can't imagine paying $9/mo for yet ANOTHER subscription service. Not for me I guess. If it works like they describe here, then probably, yes. I’m an avid reader and love Apples News app. But given most magazine subscriptions only cost $10 to $15 a year, I would have to regularly subscribe, or want to subscribe, to more than 12 magazines a year to get value from this plan. Right now my wife and I subscribe to four magazines (Nat Geo, Smithsonian, Discover, and Wired) and that is probably way more than most people and we barely have time to keep up with those. Apple, why are you wasting time & resources on this? Focus on the damn Mac already!! Oh, and you might want to give some attention to HomeKit too (and some marketing) cause nobody outside of forums like this even knows it exists. They have 123k people working for them. Surely they can do all three at the same time. Adding additional subscription based services that play to the strengths of iPad seems to be a no brainer. Plus Apple News has been a success in its limited launch. I’m quite partial to a “beautifully designed story”, ideally one with rounded corners, edge to edge text and with the typeface in rose gold. Of course they can! So... why don't they?